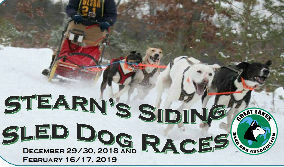 Fun Run (Not ISDRA sanctioned) 3 mile, 2 Dog Sled/Ski Fun Run. This will be run after our 2 dog junior class. You may run both days or 1 day for the same fee. You will be timed. ALL REGULAR CLASSES RUN BOTH DAYS. GLSDA MEMBERSHIP IS REQUIRED TO RACE. You can download a Membership form on www.glsda.com GLSDA MEMBERSHIP REQUIRED TO RACE. Online entries will close Thursday February 28, 2019 at 6 PM EST. Draw will be done at the close of entries on Thursday February 28 at 6:00 PM EST. No Late Entries! Directions to Race Site: From M 37 turn West on 7th Street at the Wesco Gas Station. Go 5 blocks to Cherry Street and turn left. Go to W 52nd Street, which is the first right, follow 2 ½ miles and veer right onto Wingleton Rd. (this is a dirt road). Stay on Wingleton to the race site. Race site will be on the right. From us 10: Turn South on Tyndall Road. Go to Stevensen road, turn left. Follow to Wingleton road, turn left. Stay on Wingleton road to race site. Race Site will be on the left. Signs will be displayed. Sled Bag Required in All Sleds Classes Except 1 Dog JR.